PayKit. is a breath of fresh air in the mobile scene where most financial apps want you to centralize transactions thru banks. It enables you to instantly convert your Paypal money to Cash, and thus earn savings from avoided ATM fees. The rise of mobile online payments has been very prevalent especially in emerging economies. This also paved the way for mobile apps that give financial solutions via mobile transactions. One title that seems to have the grasp of uniqueness among the sea of apps is PayKit.. 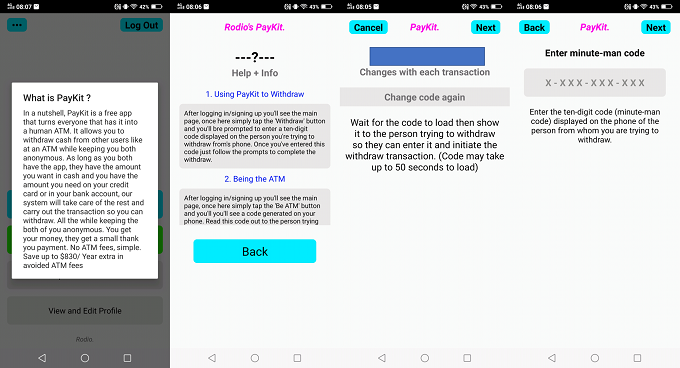 This Rodio-developed app essentially transcends financial solutions from digital platform to offline peer-to-peer transactions. What is PayKit.? How does it work? The PayKit. app is basically a mobile platform that allows any user to be a "human ATM." This means that a user can transact and/or withdraw cash from another PayKit. user locally; and in turn automatically transfer payment thru the PayKit. app. Its offline peer-to-peer transaction bypasses the need of using an actual ATM and allows the withdrawer to avoid ATM fees. To use this service, both the "human ATM" and the withdrawer should have a PayKit. app. The former should have the needed cash on hand and the latter should have funds in his PayPal account. The process of verifying and transferring the cash from the withdrawer to the "human ATM's" account is covered by the PayKit. team. On top of that, PayKit. is rewarding users who act as "human ATMs" with specific "Thank You" payments. On the other hand, withdrawers could take advantage of the quick conversion and savings they can earn from avoided ATM fees. If we do the math, they could save up to USD 830 for not paying ATM fees. Technically, I could see that this is an ingenious idea seeing the need to have instant cash without having to lineup in an ATM machine. Also, transactions are made anonymously, that means secrecy and security of users are also priorities of the app. 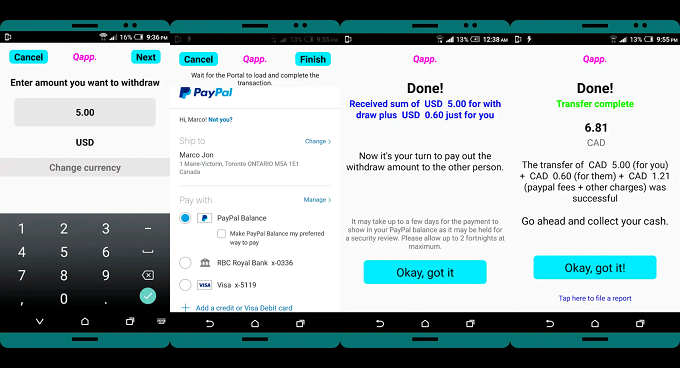 In fact, the app is integrated with PayPal which is known to have strict security policy. The PayKit. app has a very minimalist design. Using it is very straightforward. Initially, you need to have a PayPal account in order for you to sign up. The clean and simple white interface is very engaging. As a first time user, I find the app very easy to use. The main UI has four major buttons. The Be ATM button allows you to be the "human ATM," and tapping this button will take you to another page that generates your code. You'll need to give this code to the supposed "withdrawer" for his "Make Withdraw" transaction. Speaking of, the Make Withdraw button highlighted in a green bar allows the user to withdraw by entering the code from the "human ATM." The last two buttons are "Help and Instructions" and "View and Edit Profile." The Help and Instructions button has some very important information that make you understand the whole application. These include Funds Arrival Time, Thank You Payments, and more. Tapping the three dots in the upper left portion of the app's main interface will also give you a bird's eye view about the app. Opposite these dots is the logout button that you can use freely anytime you wanted to. PayKit. also has a reward system in form of Thank You payments for "human ATMs." These reward payments are given by the PayKit. system on top of the total amount sent by the withdrawer. This means that you'll earn money when you encash the other user's Paypal fund. PayKit. is a breath of fresh air in the mobile scene where most financial apps want to centralize transactions thru banks. This means that Paykit. users could cut-off bank expenses and technically saves money at the same time. It’s a practical app for practical users. I also love how the app integrates both offline and online peer-to-peer transactions without sacrificing the security of the users while also keeping the anonymity of the transaction. 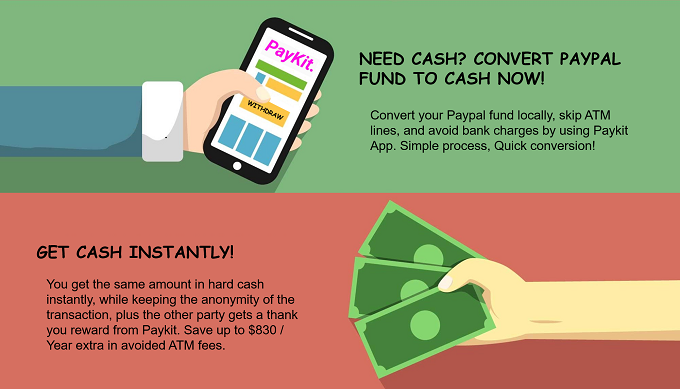 If you’re looking for an app which converts your PayPal money to cash instantly, I highly recommend the PayKit. app. 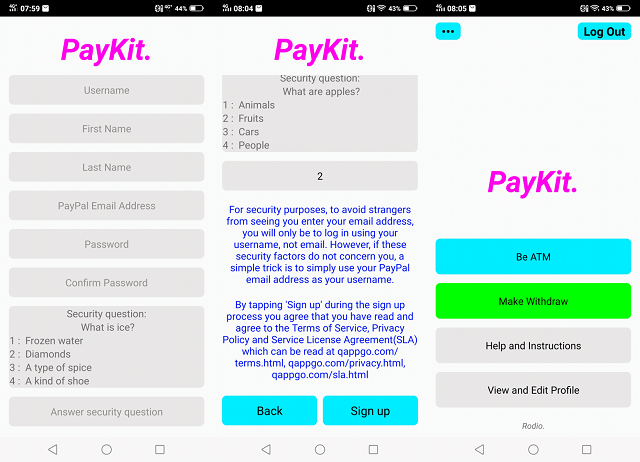 You may download the PayKit. App via Google Play Store: https://bit.ly/2UsgB4Q. For more information, visit their website at https://www.qappgo.com.